Original Parts Group, Inc. (OPGI) has released the 2016 Edition of the 1964-77 Chevelle, El Camino/Malibu restoration parts catalog. Order a free 2016 catalog and receive over 500 full-color pages filled with essential parts and accessories. 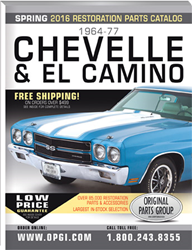 Original Parts Group, Inc. (OPGI), the industry’s leading supplier and manufacturer of restoration and high-performance parts for classic GM cars since 1982, is pleased to announce the 2016 Edition of the 1964-77 Chevelle, El Camino/Malibu Restoration Parts Catalog. From interior and body parts to engine parts, sheet metal, bright trim and everything in between, OPGI offers the widest selection and best prices on the highest-quality parts. Enthusiasts with older OPGI 1964-77 Chevelle, El Camino/Malibu Restoration Parts Catalogs will need a new 2016 catalog to keep up with all of the new parts and other invaluable information that have been added within the last year. All OPGI Restoration Parts Catalogs are comprehensive automotive resources packed with valuable information, helpful tips and insights, making them valuable restoration tools in their own right. Order a free 2016 catalog today and experience over 500 full-color pages filled with essential parts and accessories for a Chevelle, El Camino, or Malibu restoration project. OPGI also offers great new 2016 restoration parts catalogs for the following classic GM cars: 1954-76 Cadillac, 1978-88 El Camino, Monte Carlo/Malibu, 1970-77 Monte Carlo, 1964-73 GTO, 1961-73 Tempest/LeMans, 1961-77 Cutlass, F-85/4-4-2, 1961-72 Skylark, Special, GS and GSX, 1963-76 Rivera, 1962-77 Pontiac Grand Prix & 1959-76 Bonneville/Catalina. All OPGI catalogs are completely free and available by mail, phone or through the OPGI website.